See the artifacts and mummies discovered in Luxor’s tombs and temples on a half-day tour to the city’s two best-loved museums, the Luxor Museum and the Mummification Museum. At the Luxor Museum, you’ll see treasures that range from the Old Kingdom to the Mamluk period, including the magnificent statues excavated from Luxor Temple. 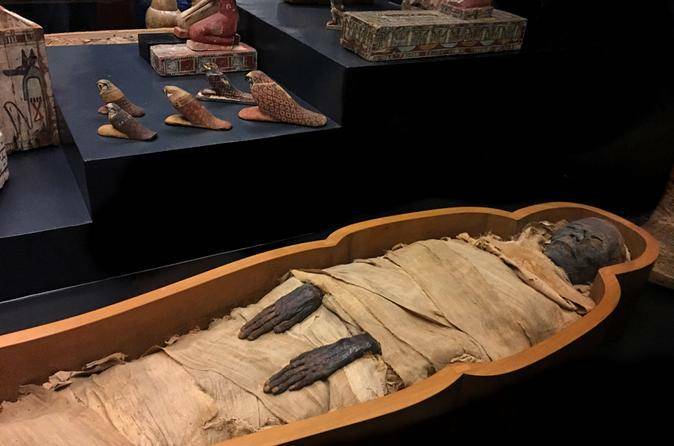 Continue to the Mummification Museum to find the preserved remains of humans and animals, as well as the tools of mummification. Pre-booking transport from your hotel to the museums ensures a hassle-free day of exploring Luxor. At 08.00am you will be picked up from your hotel to start your half day tour visiting Luxor Museum and Mummification Museum. Start the day visiting the Luxor Museum located in the Egyptian city of Luxor (ancient Thebes). Inaugurated in 1975, the museum is housed in a small, purpose-built building. The range of artifacts on display is far more restricted than the country's main collections in the Museum of Antiquities in Cairo; this was, however, deliberate, since the museum prides itself on the quality of the pieces it has, the uncluttered way in which they are displayed, and the clear multilingual labelling used. Then Transfer to Mummification museum It is located in the Egyptian city of Luxor. It stands on the corniche, in front of the Mina Palace Hotel, to the north of Luxor Temple, overlooking the River Nile. The museum is intended to provide visitors with an understanding of the ancient art of mummification. The Ancient Egyptians applied embalming techniques to many species, not only to dead humans. Later transfer back to your hotel in Luxor.